Why should you spend the time and effort required to increase your IQ? What benefits will you get? There is good evidence that having a higher IQ can benefit a number of areas of your life. Research by Zagorsky, Jay. 2007. Do you have to be smart to be rich? The impact of IQ on wealth, income and financial distress. Published in Intelligence 35: 489-501. 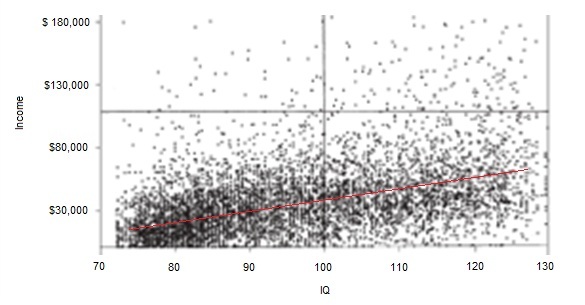 The chart below taken from this research paper shows the	correlation	between annual	income	and	IQ,	with the	red	line	showing	the average values. At first glance it might not look like a big difference, but check the scale on the left, an increase in IQ from a score of 100 to 130 translates into an average increase in income of over $20,000 per year! 2. A higher IQ helps you pass exams and achieve academic success. Now this might sound like an obvious one, but there are many students across the world who work very hard, only to end up with C grades and lower. The problem isn't to do with their effort, its to do with the advantage their peers with higher IQ's have. A higher IQ means you can learn new information and skilsl quicker. Getting through more material in the same amount of time, and freeing up additional time to go back and revise concepts not only helps you learn but also mkaes the learning process a lot more enjoyable meaning you are more likely to sit down with your books in the first place. One of the defining features of intelligence is the abilty to analyse problems and identify appopraite solutions. With a higher IQ comes an improved mental capacity to understand complex business problems, and find the right solutions. These skills will help your business reduce it costs and generate more profits. In a number of surveys conducted over the last two decades on IQ and Perceptions, participants continually rank percieving someone as being intelligent as one of the key factors in determining whether they woudl respect and look up to them. The increased problem solving and creative abilities that develop from having a higher IQ mean you are more likely to come up with original ideas or insightful suggstions which can generate this perception in others. When you increase your IQ, what you are really doing is giving yourself a greater freedom in your life. With improved prospects in the income you can earn, academic studies, and the busienss world, you are giving yourself more options to choose from. Better problem solving skills will also help you tackle the every day problems we all run into throughout out life easier and faster, freeing up more time to enjoy the life you choose.. Whatever goals you have, you can take a first step towards achieving them by improving your IQ.